Barrage of misinformation: can’t they read? Has anyone actually read our application for a judicial examination of the national temperature record? Or the backgrounder we so thoughtfully prepared? Or seen our simple, spectacular graph? Wow! What an explosion of nonsense. Hearing some of the comments about our court action against NIWA, you could be forgiven for thinking that the Coalition was made up of stupid people. But the stupid ones are those mouthing off a torrent of misinformation against us without reading what we’ve actually lodged with the High Court. I have time only for a couple. I’ve been following [the Coalition’s] rather weird obsession with the New Zealand temperature record very closely on the blog. It’s not a weird obsession, Gareth, it’s a weird and impenetrable temperature record, which you would know by now if you had bothered to take a look at it. … all that Bryan [Leyland] wants is already there. The raw data you can download from NIWA. 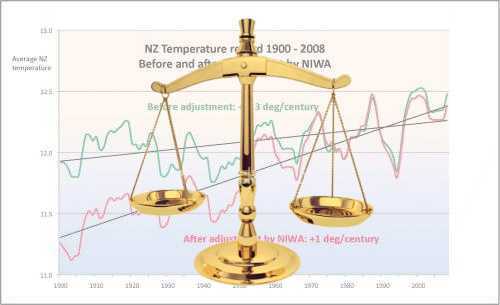 The adjustments that are required have been listed by NIWA; the methodology for doing it is available in the peer-reviewed literature; it’s incredibly non-controversial to climate scientists and meteorologists that you need to make adjustments.